The best way for us to help you is by writing in our support forum. You can also post a comment here if you really want our fast answer, but usually here other people won’t comment so you won’t get help from our community either. For Verizon you have 2 available settings (Verizon with ICCID and without ICCID). You can program the settings using the available software and dongle or if using the menu (go to http://www.aio-sim.com/settings/ select Verizon, write the serial number, and choose DELAY 6). Because you have iOS6 and you can’t jailbreak SMS/MMS won’t work. Also it might be possible not to see the signal bars appearing, but you can still call. Please check ! Trying to go from ATT to T-mobile. after step d), the phone says “searching”. Then for about one second the T-mobile network appears, then immediately after, I get a “SIM not valid” message. any help? Hi, please have some patience today, we will release soon an update! Don’t do any more tests for the moment. Please check with the seller of the product to provide a dongle. I am sure he will. You can check the latest update and download the V2 software from the downloads section ! Can I unlock my iphone 4, too? Can I unlock a blacklisted iphone? No, sadly AIO-SIM can’t be used to unlock iPhone 4 latest baseband. If the phone is activated it does not matter if it’s blacklisted or not. tried all sorts of combinations, made ​​up life Ukr. earn, immediately tried a combination with MTS, it did not work, shows the name of the operator, checks the account, but no calls or sms do not work! decided to once again try to Life the same, only the name of the operator …. how to overcome it? have any ideas? T-Mobile Germany is working fine with the settings from the software – DE T-Mobile default. Make sure you also use the GID1 setting. Put delay to 8 or 10. V24 must really work with most of the operators everywhere. Did you update your card firmware to V24? If you have an Sprint or Verizon phone then please use update V25 and V26. How many updates have a new gevey? 20 or 5? do you have on stock can i order ? How many do you need ? I will let you know in 3 days once some stock arrives in Romania. something about 200 pcs maybe you can send me a quotation via mail. We speaked this week about coming gevey in Romania and you told me that in 3 days you will tell me exactly .. any news ? it was a easy way if you give us a yahoo / msn / sonrok or email id ( becouse i sent you emails but nobody answare ) to comunicate easyer. Shipping to Romania usually takes about 7 to 10 days from Hong Kong by Hong Kong Post but usually we can send you from the stock in Romania so it will be like 1-2 days max. We’ve sent you an email. Please respond to it. I am sure anything you are experiencing can be fixed. I love your AIO Sim, V24 its perfect, can you do a V24 with internal phone menu to let the final user change the IMSI? It would be so nice. Please post here the code you are using. Also post here the Serial number of your AIO-SIM. Another thing you can send us are the numbers displayed but the phone after the serial number. Please post all this so we can help you. ja resolveste o teu problema? IMSI must change from 310410 (US AT&T) witch is the default to GR Vodafone so seems your AIO-SIM it does not accept the input string. After the setting are applied correctly the numbers after IMSI must change. So copy this inside your iPhone memory, then insert AIO-SIM and when you see the message PASTE this long number FAST, try to be really fast, like 1-2 seconds. my carrier is PT vodafone, that change anything? It is important only the original carrier of your iPhone. If you write here the IMEI i will check it to be sure is GR Vodafone but it will take few hours. Try like i said before, and be fast, don’t want when you see the message. im sure that my original carrier is pt vodafonee! So if the carrier of your iPhone is PT Vodafone then you must select PT Vodafone in the list in the settings page. If it’s GR Vodafone then you must select GR Vodafone. You got me a little confused here. There is one more thing you can do, update your card using the dongle and the software from the download section to V24. This MUST work! [18:24:47] AIO SIM not detected at existent ports! [18:24:47] Please reinsert AIO SIM DONGLE test connections or reinstall drivers! If the LED is GREEN then the dongle is not properly installed. The dongle LED’s must be RED. Please check in Control Panel -> Device Manager that you can find the USB dongle under Ports and that the COM port value is less than 10 (Prolific USB serial COM port). If there is an exclamation sign then click on the device and Update the drivers with the ones on the website. That is also not good. The middle pad of AIO-SIM shortcuts the dongle pins and this is why you get green. There should be red. Please put the AIO-SIM a little bit to the inside. You should see the GREEN led blinking just a bit but the LED should be red and then press Connect inside the software. I will let you know in the morning. you recieved the payment from my paypal same as my email adress. Payment has been received. As i said in the morning Romania time i will confirm the shipping. where to copy these settings? you can go in? i need some informations ,read you email. We already send several emails, please check. Please contact your local Fan Curier to get the parcel. Let us know if all is ok ! Hi friend please reply me at the yesterday mail … i want to be ready …. You have the best service,recived my geveys after 3 days after my order,thank you very much. Please use another simcard to do the update of the settings. Maybe there is some compatibility issue there. You can always COPY PASTE the settings very fast. Sorry about the videos, i will put the links directly in User Guide section. Please check in 10 min. Happy to know that the videos are useful ! I’m not having much luck unlocking my US att phone with a tmobile sim card. It just keeps saying invalid sim. AIO-SIM is preprogrammed with AT&T Settings so this should work out of the box with no settings. So the invalid SIM meesage is clearly because of an incompatility with the TMobile simcard. Have you tried with anohther simcard ? The IMSI displayed in the welcome message (after the serial number) should be 310410 if you require AT&T to work. The sim card works in my old 3gs ultrasn0w unlocked phone, so I assume the card is ok. The number I get is 310410 so that seems right. The phone does say t-mobile briefly but won’t make a call and then flips to invalid sim. I do have an inactive att sim and it also says invalid sim, without the unlock card the att sim reports no service . Note I’m still at IOS 5.1.1 … not sure that makes a difference. The server for IMEI is offline for the moment, should be online soon and we will check your IMEI. After this i will recommend you the settings. and when i go thru the activation process, the sim is not valid. Did you update your SIM to V24 using the online update software. You can try V24 as should work better then other firmwares. Please also post here the IMEI of your phone so we can check if the settings are right. Are you 100% the phone ‘soft resets’itself ? This is strange. IMEI 990001042157982, the phone screen turns black and apple logo shows then after couple of seconds, the message “Activation Required” shows. i did update it to V24 – GEVEY AIO iPhone 4S iOS6 with DELAY. I paid 9$ for update key. What I must do now? Hi, we have send you the update key but please explain for what you need it so we can help you. hornet22@rkmail.ru I receive the key. How can I use update key? How can I use AIO SIM V3 with update key to refresh sim updates without update key window in programm? I need update sim to V27. Help please. Hi, sorry for the 1 hour delay. I have reset your card counter. The update key was designed for old variants. You should not update the card so many times either. Please update once and then write only the settings, this way it won’t consume your update counter so fast. I will refund your money right now. US Verizon CDMA V27 need activation after 1 min. All presettings from programm. With fast option all the same. Need help. Hello! What about the Russian operator MTS? Recall that on any firmware it does not work fully! Only on version 24 is the incoming and outgoing calls. SMS and the Internet do not work. Neither the firmware 25 26 27 opertor this does not work. Constantly requires activation with different values ​​and parameters! Please solve the problem! Thank you! We are working ok this issue right now. Hope we will solve soon. Thank you very much! Are waiting for the result! Yes FORCE be with you! What do you say about the Russian operator MTS? In one of the post you are asked to send you a SIM card of the operator. Sent you like it someone else? Does the work of the operator to work with Gevey? All Russia is waiting for your result! Please enter us in the course of the case. Maybe there is a solution? When you make the work of the operator with your product?Really hope for you! Thank you! I was just talking with some people there about MTS and deciding how to make more tests. The problem is that MTS uses USIM only simcards and are not compatible with the latest V25,26,27 updates but we will try to come up with some solution about that too. We hope for an early solution to this problem! How to make order for 100 pcs? You can order directly on our webpage, you can buy 10 packs of 10 pcs each for regular customers (without dongle) and you will have the discounted price already. Just keeping showing invalid sim. this solutions is not getting me anywhere. Yes, please give us the serial number of your cards and i will reset the counters. In my opinion is allways good to keep a AIO-SIM because we do regularly make updates. The next one will be really soon. I went ahead and did a factory unlock. I took like an hour to complete. I would have liked to have used my aio-sim but without proper info I wasn’t having much luck. I tried several revisions of the firmware. v25, v21, v18 … nothing worked. Sorry but I got impatient and just went the factory unlock route. Hello, what is your warranty period? As you can already see we are updating this AIO-SIM for already 2 years now and the FREE updates will continue. About warranty we usually replace few pieces from order to order depending on the problem. So software errors like cards that look ok but don’t work we will replace them even after 6 months. Hardware errors we usually don’t replace them unless it’s because of the shipping witch rarely is because we try to pack them nicely. Are you will do a new cdma firmware(v25-v27) for old gevey aio cut version? I buying a many pcs, and now can’t fully unlock with v24 on cdma iphones. Thank you. Hi, we have stopped selling the CUT version very long time ago (around 8 or maybe 10 months). I can’t promise you right now something but maybe we will do some update but will not be free, maybe will be around 1 USD to update 1 pcs. I have more than 10 unopened gevey aio cut version. Now it will work only with jailbreak! But v25-27 work without jailbreak. Are you will support your clients? how can i solve this issiue. addtion while i was doing try to unlock my a gevey sim update perriod is full and now i cant this gevey. Please give us the serial number of your GEVEY that has the update counter full so we can reset it to zero. For Verizon please use the special Verizon update, not V24. You can also use V27 and select US Verizon 4S CDMA as setting. Please give us the serial number of your AIO-SIM and we will do that. and sold more than 300 units and State well but I have a question for the aio-sim not work with 256kb chip chip only work if I could say 128kb settings I’d appreciate one. Just have a question now, i think that with update V24 also 256kb sims must work. What settings/phones did you tried ? are you talking about MTS-Russia? do you have stock in romania? Hi, sadly we can’t support 256kb simcards fully now. Have you tried with update V24, this should be the only one working partially. I mean you can call and be called but without signal bars appearing. I have another question buy a pack of 100 units but when I put the sn I get this error. Your SIM AIO SN is not valid. Please press BACK button on your browser and try again. If you think there is an error on our side please contact us directly. Please check again. Everything should work fine now as we have updated the database. Hi! How many times will be dilivery to Russian with DHL express service? if we buy DHL express for 25$ tomorrow? Hi, as i understand from other customers shipping by DHL to Russia is not a good option because the customs will check and ask you to pay a lot of customs fees. I am having a problem getting this to work on US Verizon update sim to V27 and no luck searching for 2 mins then asks for activation. Same thing happens with V25 ? Please post here the log with the settings you used. (the LOG file is in the same dir with the exe file). why did you answer my post ? Hi, sorry about that. We are very busy and sometimes it happens to skip one post by mistake. Your serial is already ok from yesterday, we have resetted the usage counter to 0.
is there any offere setting for vodafone turkey sim ? or update soon ? Hi, i have a friend that has another Verizon similar with yours that displays activation required. I will ask him to make some tests and then come back with an exact answer here. The Verizon i have tested works with the updates i have made so there must be some exact issue here. Br! here is the log for V25 same thing happened still asking for activation using US T-Mobile micro sim card. [13:14:13] [SETTINGS] Unlock Delay is 6. [13:14:13] No GID1 will be used! [13:14:34] [OK] Settings applied successfully! We have reset your update counter. Please wait for the next update V28 to make more tests, it sould be available in 1- or 2 days. Regards! I have the aio sim for ios 6.0.1 4s. But the card dont work. When i put it into it it asks me all the time for this code, then i it copy into the field but then few moments later it asks me again. After One Minute the Apple Logo is there and the iphone says no valid sim. What i make Wrong ? You are a little bit slow to inputting the settings. Please copy paste the settings as fast as you can and it will work. 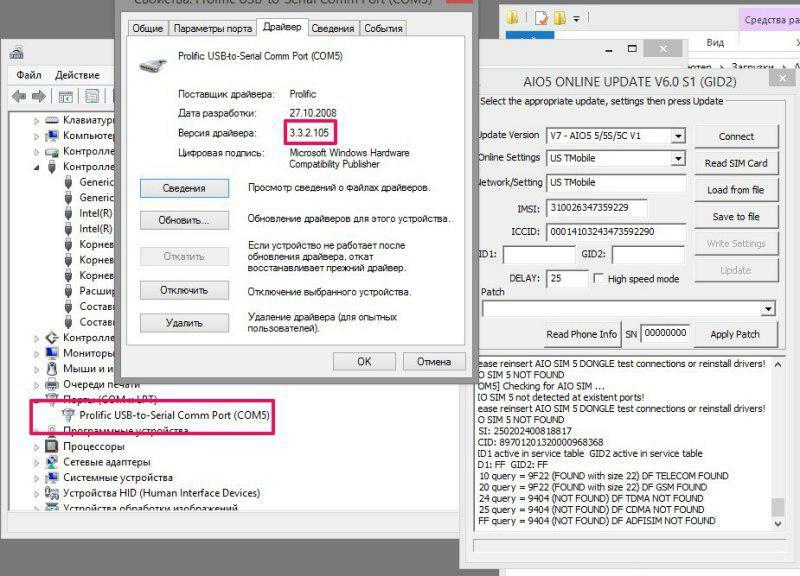 Another option is to use the update dongle to update your AIO-SIM to V24 for example and choose the correct settings. hello, I have problems ios 6.0.1 iphone 4s orange austria someone can help shape. My dongle in windows 7 doesnt function. In the driver details there stands not 1.5.00, it shows 3.4.36.247. What i have done wrong ? I also couldnt connect..
Hi, I really need help. My phone is locked to AT&T. I tried a lot to unlock it with no luck. 🙁 I paste that long code as fast as I can, network appears, but without a carrier name. And then, in 2 sec, apple logo is shown, and phone asks for activation. I don’t know what I’m doing wrong.. Also now I can’t even get code, it says “You have reached the maximum number of requests for this serial number!” Can you reset it, please? Ok, i see now your IMEI, we will check it and reply here. What is the network that you are trying to use your iPhone on ? It’s LT Tele 2. Settings says that’s a AT&T, but I’m not sure too. Hi, AIO-SIM is programmed to work from the begining with AT&T so it is very strange that you even had to write any settings there. Also it’s very strange that the phone asks for an activation. So in my mind the only possible thing is that your phone is not really from AT&T. Please give us your phone IMEI and we will check for you to see exactly from where is your phone. Yes we can reset the request number. I do need the serial number for this. Where to get that number? And how it looks, not 059F40A9 ? Total requests = 0, you can update your AIO-SIM again. I tried with apn and network settings, without them. Still one result. No sim>no network>network appears but no carrier name> apple logo and activation request… What can be wrong? I noticed that in window where I need to paste code imsi is 310170. But as I remember it’s AT&T imsi. Lt Omnitel is 24601. Maybe I should try to restore my phone? Hi, so if in the input settings message you don’t see the new 24601 IMSI then there is a problem. Please try to use the update dongle to update your AIO-SIM. Seems there is a problem with you updating the settings using the internal menu. Oh.. I dont have dongle. I get aio sim with my iphone. 🙁 any ideas? 🙁 12$ and 2 weeks waiting shipping. I think it will be faster to sell this iphone. Btw i still didnt tried to restore firmware on my phone. I think all this s*** caused by pasting codes for att, which is not my carrier. What Country are you again ? Im in Lithuania. Shipping is from china? We have USA, China and Romania stock for EU shipping. Okay. Shipping from Romania will be fastest, i think. I will fix my pc today and i will try to restore software. (Maybe update to 6.0.1) if it wont help i will buy that dongle. Hello, I just got my AIO Sim yesterday serial number #SN f68e20ab, when I powered the phone on with the AIO SIM it gave me the serial number a couple times but its not doing that anymore. I cant get it to program my settings either. I know the dongle is working because it does read the iccid and imsi numbers. But when I try to program the AIO SIM it is not found. Just received my order from Ebay. Im using Windows 7 64 bit, the only way I could get the dongle to turn on was a unsigned driver from Prolific. Which seems to do the trick. Please Help. Sorry Robert but if the AIO-SIM is not responding anymore please ask for replacement. We will replace it fast. Meanwhile please tell us what phone are you trying in unlock (if you don’t know the original network we can help you with that – give us the IMEI) and on what network you are trying to use it. Could you answer my email and help me finish unlocking TMobile germany. Is your product also going down?? Are you going to keep your servers live? Are you a clone or original and what is it about?? As you can see we already release iPhone 5 AIO si i think you can judge for yourself if we make clones or not 🙂 There wasn’t an original AIO 5 to clone. iPhone came to me with the original T-Mobile DE SIM card. With the original SIM card, his successfully logs in the Ukrainian operator MTS and works successfully. Connect AIO SIM in DONGLE, choose the firmware v24, select presetting “DE TMobile – DEFAULT”, do “Update”. Then, together with the SIM card of the Ukrainian operator (KYIVSTAR MCC=255 MNC=03) and AIO-SIM is installed in iPhone. Turning on the power and the iPhone get only “Searching …” and “No Service”. Parameter “DELAY” tried in different variations 6,7,8,9,10,17,18,25. But the result is always the same: “Searching …” and “No Service”. Do you know this problem? Why in the description of this product is not listed (in fact for AIO5 are any problems with the T-Mobile DE). Can you confirm or deny the existence of such problems for the AIO SIM 4S NO CUT. Hi, i can confirm that users have problems with the TMobile DE phones with CDMA operators like MTS, with other operators should work. iPhone T-Mobile DE is not CDMA! It turns out that the AIO SIM can not do such UNLOCK T-Mobile DE iPhone 4S. Planned in the future version of firmware to solve this problem? KYIVSTAR, a card that would like to use with this device is also not CDMA. MTS Ukraine is GSM operator. Planned in the future version of firmware to solve this problem? Us Verizon iphone 4s ios 6.0.1 bb 3.0.04 not working with Cosmote gr. This is a Greek sim card I used with jailbroken 5.1.1 and gevey aio no cut with no problem. I try v25, v27 and deferent delay settings but always Activation Required. With v27 and preloaded settings us Verizon 4s cdma my second number Q card gr (Q-TELECOM WIND GR) working grate. Is there any solution for Cosmote gr? Hi, we are working on this, please come back in few days. Now in Russia only one operator – MegaFone – worjing with iPhone 4S t-mobile. This is about T-mobile iPhones. For CDMA – Verizon and Sprint – all working good at v25/26, but only one operator MTS is not working with 25/25, only with v24. And when you’ll post video of iPhone 5 unlock? hi.can somebody help me with full Vodafone Spain IMSI, ICCID and GD1 ? [11:04:00] [ERROR] Could not connect to server. and firewall is not blocking access. Hi, are you sure is not working ? We have tested it right now and it’s ok, maybe it’s some firewall problem. Please check ! I just updated the paypal with the tracking number. Because our shipping company was so slow i will give you discount in Paypal. Br! I can’t install the drivers for the usb dongle properly. The file (driver for 32 bit operating system) available for download on the website is a zip file. So how should i install the driver properly? You can go to control panel -> system -> device manager then press right click on Prolific USB to Serial Com port then press Browse my computer for driver software then point the path to the place where you unzipped the archive available for download on our website. When i pressed on browse my computer for driver software and pointed it to the location where i unzipped the files, it doesn’t let me choose the version as shown on the tutorial video. When i put the aio sim onto the usb dongle and press connect, it shows this message. [17:37:14]  Port open failed ! [17:37:16] AIO SIM not detected at existent ports! [17:37:16] Please reinsert AIO SIM DONGLE test connections or reinstall drivers! Please check your dongle white switch is in on the outside (opposite of the USB connector of the update dongle). Did you checked and the USB dongle is on COM4 ? It’s strange that the program will give you the error message Port open failed! I think i have a different switch from what you are trying to describe here. The white switch i saw is on the side of the usb dongle, and i’ve tried both positions and both also doesn’t work. Please tellme what to do. If you tried everything and it’s not working then we better send you a replacement. Sorry for this. We have finally managed to upload a youtube video http://www.youtube.com/watch?v=o6ArHIhEYrs using Chinese internet. over a week now and nothing. Sorry for the speed of updates. As you can see if you check the website we have been busy building the forum, releasing iPhone 5 and and helping the customers who already bought to install the dongles etc. We will try to release tomorrow after we do some more tests. Can you please show us the settings you used and what is the problem (activation required screen, etc). Please use the forum for this (you can register at the bottom of this page) so we can discuss it better there. Parameter “DELAY” tried in different variations 6,7,8,9,10,17,18,25! with these parameters phone displays the name of the operator but without network-level checks Ballance! calls do not work, the Internet, SMS! If I remove the value gid1 the phone falls into the activation! I can still help you to quickly solve this problem? p.s. pereprobyval hundreds of configurations and any equipment! Hi, sadly it won’t work on iPhone 4. It’s working good only with 4S models. If you baseband is less than 4.11 then you can still try the iPhone 4 update (you need to update using the update software). It will only work with the calling on 112 or 888 method. Br! ok , my modem firmware is 4.10.01 , so i can use it, what firmware do i need to update my gvaio sim through dongle? what settings have i use to? managed to achieve one time he called, did: put the original sim t-mobile, hand-selected operator MTS, turn airplane mode on, pulled the sim, put mts Ukrainian, turned off the airplane, the name of the network but not the signal, and the phone call and receive sms , but after a reboot will not have: (!!! Only Megafon in Russia is working with T-mobeli iPhone. aio 5 software v5.1 carrier setting for US sprint locked iphone 5? so many sprint carriers in software: us sprint lte, us sprint, us sprint 5, us sprint ota? Tried all via upgrade aio5 w/dongle succesful update but does not work in iphone keeps going back to activation screen w/tmobile us and att us sims. HELP PLEASE have already wasted 4 updates trying the different US sprint carriers. Hi, did you tried with Version 2 already, if no please try ? ALso please use ICCID starting with 00 like this IMSI:334020112155322, ICCID: 0052020911495222075F. Did you tried also with other simcards type different from iusacell ? Another question did you tried iPhone 4S locked to telcel to use on iusacell ? If so what are the settings you used ? where you have the version v2¿? My iphone is locked to t-mobile uk. It works on my iPhone but I could only make calls and SMS but the 3G connection does not seem to work. AIO для iPhone 5 к сожалению работает только с картами LMT в Латвии, TELE2 и BITE пишет ошибку сим карты. Будем ждать обновлений. i have used v24 with verizon w/o ICCID AND call is work but sms and 3g not works. orki you have to install v24 again. result is same, it wants activation required with this setting but i have some results. i think gevey aio hasn’t not to change carrier name in about section. i watch youtube video which is about other gevey sim and i saw that when it unlocked iphone 4s, carrier name was not change in about section. maybe it gives an idea . TMobile germany is not a CDMA phone and should work with V24. Please use the forum for such requests. Also you can check our software because it includes most of the information you require. Mine doesn’t work on Sprint iPhone 5 with T-mobile USA SIM. Asks for activation. I’ve chosen V2-improved US Sprint 5 while updating. Please help. Did anyone have luck unlocking Sprint iPhone 5? Multi-SIM.ru: Работает ли это решение в России? Если да, то с какими настройками и какими операторами? Спасибо! is SMS working on iPhone 5 cdma? If old sim, not Usim. Any chance to unlock 4S 6.0.1 via AIO? Not working on any version, shows only operator without signal bars and not calling. Please help. Hi, 6.0.1 must really work. Please update to V24 and program it with the operator on witch your phone is locked (sometimes people try to program with the operator they want to use and will not work). Hi, this is my second one I’m using (the first worked fine). It’s for a japan softbank iphone 4s. But the problem is when I get the message that I can insert the code for the settings it just doesn’t change it, the imsi stays the same. I am copying and pasting it so I can do it very fast but still it just doesn’t adjust itself. What can I do? So I see that the admin is responding on other people’s question 2 days after I asked mine. for iphon 5 sprint whith AIO and last update SMS whork or not? (MTS Ukraine) ??? Terrible Support! PLEASE HELP / ANSWER!!!!! Hi! Have a BIG Problem! I cant unlock iPhone 5 (HUN T-mobile locked), we buyed 20pc of them, but we cant sell it, because any setting do activate all the time! Please FIX it problem! Udes V1, V2, with and without ICCIC, Delay 6,10,18,20,25,30,50 and nothing! Hi, the delay is not important for V1 and V2 iphone 5. What settings did you used? Why didnt make answer? Where are the helping support? Hi, sorry for the late reply. Did you tried to use the original ICCID with 89 ? Also are you sure there is no GID ? If you can use the full ICCID and the phone will not display the activation screen but will show no signal this means that for the moment our AIO SIM can’t unlock phones like this. If you still get activation required no matter what you try then maybe it’s a simcard compatibility problem and you should try with another simcard. and cutted to nano sim. From your picture i can see this is a new simcard model. The old ones must have 8 metal contacts not 6 like this one. Please try to find older simcard. i have gevey for iphone 4s in portugal, all works right but can’t send MMS, sms i can send but no MMS. THoMZoNE, do you have iPhone 5 tmobile, which is working with AIO 5? What settings? What carrier and country? Is that working without ICCID, GID, but just old type sim cards. Admin, how much digits we must input for PIN1 in AIO5? Is it important – 5 or 6 or 7? 7 is the maximum accepted. What is important is to check after you applied the settings if the settings have been really loaded. This is easy as next restart the new settings will be displayed. where new settings will be displayed? I can’t say that thing doesnt work at all. I made some calls with a totally different carrier’s sim card. But after all it went to SIM CARD FAILED. I reached the limit of the serial number requests. That’s weird but the AIO sim just stopped working…why is that. My iPhone 4S came with a HU T-Mobile Carrier lock. So what tell me, what should I do right now. So now I cant do nothing. What is the magic move? Plese, tell me. Do you have more pieces of AIO SIM or only 1 that is not working now ? If it’s working do you have it’s serial number so we can reset the requests number for free. Also bout the USB dongle please check. http://www.aio-sim.com/forums/topic/aio-update-dongle-and-drivers-short-how-to/ I assure you the drivers on our website are working so please do use them. We recommend windows 7. I have one AIO SIM. I tried many serial numbers with different delays, but with after the 2nd restart nothing happened. Than I tried to turn on and off the airplane mode, than my other sim card(not the T-Mobile one) worked for 5 minutes, then I got the message sim card failed or SIM Failure. SN F88D39C0 IMSI 216300 That was a number what I got. Also my iPhone 4S is jailbroken and has 5.0.1 iOS. Ha ezek sem működnek, illetve azt mondja Connect-nél, hogy nem talál AIO simet, akkor lehet meggyűrted vagy valami mást csináltál vele, és meghalt. Én az iPhone 5 geveyből már 3db-ot selejtté tettem. A régi rendszerű 4S kártyák közül pedig sok könnyen selejtté vált. I have same problem with one card. After unlocking, 3-5 minutes later have “Invalid SIM” message, and need restart the phone. Have 6.0.1 used V24, UK 3 Locked phone. hello! I finally Founded way to run the iPhone 4s and germany t-mobile! 1. insert sim card into the phone (no gevey), which will use it in the future! 2. the phone will ask for activation, pull the tray and insert a sim! 3. dial 112, 5 seconds to shut down. 6. wait 15 seconds, and our phone fully working! P.s. phone shows only the name of the network without signaling! able to run with 3 operators of Ukraine! я вечером видео-мануал сделаю! а пока работает без сбоев! Somebody told me that the AIO-SIM card might went wrong. And it could be. Well this is really awkward, cause I bought that thing from eBay as a GEVEY sim card. I can see now, it’s not an apple’n’berry SIM. But as I told you…it was working for 5 minutes once than I got the message ‘INVALID SIM’ or something like that! Now I got the message after restart or after switch airplane mode on/off: ‘No SIM card’. I have an Orange Spain locked iPhone 4S, tried with more version of AIO but none want to unlock it for Vodafone RO, with Orange RO works OK, but with Vodafone, no. What can I do? [15:24:10] [SETTINGS] Unlock Delay is 25. [15:24:10] No GID1 will be used! [15:24:11] Timeout while waiting for card response! [15:24:11] [COMM]Communication Error while reading presets! – what is a problem? Can you send me some of this cards back to test ? One question about this card error. When you connect to the card the card is in UPDATE MODE or NORMAL MODE? [16:35:31] [SETTINGS] Unlock Delay is 25. [16:35:35] Timeout while waiting for card response! [16:35:35] [COMM]Communication Error while reading presets! Can you please send me back this card someway ? i`am from Romania…is ther any change ? I can I unlock the iPhone 4 Softbank Japan with your product? i buyed 10 piece of AIO 5 with Dongle. Dongle dont work – i see Error “code 10”. 4 pices of AIO dont work too. you can check it sn of one card is a3b5cb81. i want work dongle and AIO. Hi, from where you buy this 10 pcs? About the dongle please check -> http://www.aio-sim.com/forums/topic/aio-update-dongle-and-drivers-short-how-to/ you are surely not using the right driver. About the settings area i will check and solve this later today. i buyed it from you in ebay. now i update my AIO – and iphone want activation again… ((( What to do? and dongle is work. iPhone dont want activaion, but no one AIO is not working and iPhone did not see my carrier. Please use another simcard to unlock your phone. I think the simcard you are using is not compatible. Try to use an older model of simcard with 8 contacts (not 6). My sim is 8 contact. I try with all AIO that i have, all of them i write same settings, but only one AIO is work with my carrier. only one AIO from 10 is work properly. [16:14:29] AIO SIM not detected at existent ports! [16:14:29] Please reinsert AIO SIM DONGLE test connections or reinstall drivers! Before you ask: The dongle is showing a red light. I’ve checked, if the correct drivers are installed. I’ve checked, if the switch in the correct position. 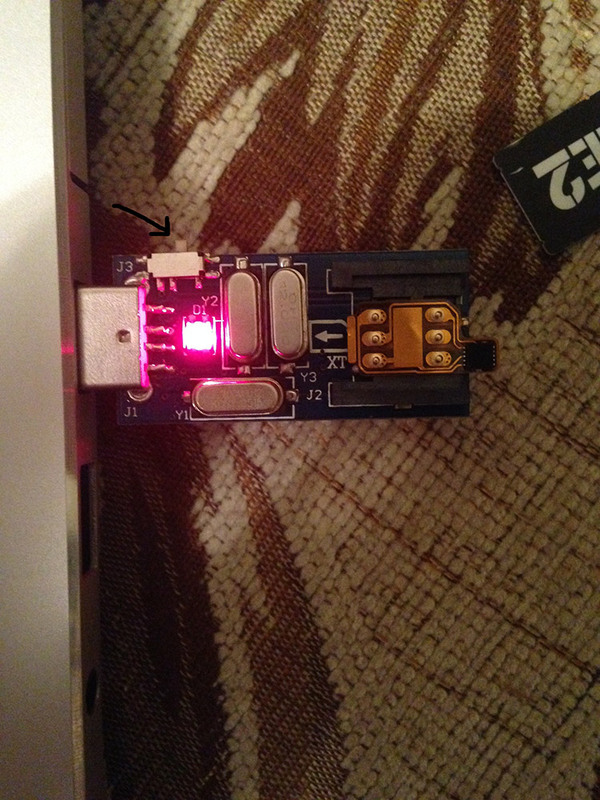 The dongle is showing a red light, when the AIO SIM is connected. I’ve tried this several times now on different computers but I had no luck. The software is always responding with AIO SIM NOT FOUND. What can I do? Do you have more pieces or only 1, as i can see here all is ok so maybe you need another AIO. If so please ask for a replacement. (also follow the guide from our forum on how to put the switch of your AIO Dongle, you can check if the dongle is ok by trying to read a GSM simcard using it – press Read SIM and see). I have only one AIO SIM. I’ve tried to read a regular SIM card and the dongle shows some result. At least the software can tell the difference if a SIM is in the dongle or not. Do you think the AIO SIM needs to be replaced? So if you can read the simcard then you only need the AIO SIM to be replaced, if you can’t maybe the dongle is the problem. Hello There! We have 2 pc of bad AIO sim, last day i used that successfull, but next day is finally “dead”. When i put to dongle, the red light switch to off…i tried with 3 pc dongle…same end. Please contact us on your next order with this information. Have info about new Unlocking AIO5 Version to supporting new type of sim card? Release date or something? Thank You! what settings need to write by dongle for iPhone 5 sprint? SOS Please, i need to fix that phone! PLEASE ANSWER! I already replied on other part of this website. Please also check your email. Oookay, but where is the other part? Please reply here, I’m interested too. Calls work in 1 minute. Network name – in 5 min. my problem is continuing which is noservice but call works, sms and 3g not working. because i didn’t use 3g data service with turkey vodafone. Hello, I got iPhone 5 locked to Sprint. I got Gevey AIO programmed using Sprint 5. I got Calls (receive, send, carrier name), however not 3G. Not 3G signal appeared. Can’t send SMS only receives. Hi, about SMS this is normal and can’t improve for the moment. About 3G i think you sould enable Data Roaming into the Network menu. Data Roaming is ON, not success. Still no 3G on the phone. About two weeks passes. Is there any improvement regarding the SMS? which delay did you use? Normal delay of 10 should be ok.
Is there any solution for correct settings for iPhone 4s fw 6.0.1 from T-Mobile Germany? Tried on AIO SIM fw V28. It still cannot pass activation screen. Please use V24 with T-Mobile Germany! what delay are you using? I’m trying to get a US Sprint 4s ios6 working on Straight Talk. I’ve tried v24,v26,v27,v28 with different IMSI and multiple delay’s and it always goes to the activation screen. Only on v24 it was searching and just switched to “No Service” but never went to the activation screen. Tried multiple delays and no change. I had this exact phone working on v11 when it was on ios5.1.1, I used the same IMSI and can’t get it to work. Any help please, thanks. Very often a brand new sim card solves the problem, so do not try on old sim. Its the same SIM I used when it was on ios5.1.1, I tried with a tmobile SIM and same problem just keeps going to activation. What settings should I try? If is is searching and then no network – please make factory reset of all iphone settings. Then power on phone, wait until there is no sim card message, accept it, insert sim card+gevey and wait for no network. Then go to operator settings, select Your network manualy, remove sim+gevey and insert them again (it worked for me without re-poweing iphone). can you help with right preferences ? iphone 5 not work orange spain. what about work in IOS 6.1? Hello, yes what about iPhone 5 6.1 ios Support? I cant update the dongle… I already followed all steps and still I see the yellow triangle logo… When trying to install the drivers it says error 10.
with what version is workiong beter? v24? Is the AIO 5 compatible to unlock iPhone 4 with the correct tray? Admin where can I request an exchange 6 out of 10 are not wroking… I need a refund please this is the fourth time I post and nobody has helped! We’ve replyed you by email to check what is the problem and exchange the not working ones. Since, there is a Jailbreak solution to iOS 6.1… AIO SIM developer team should think in make a solution based on Cydia to solve DATA 3G issues. Now that the jailbreak is available we will test new ways to solve this. Good luck! Im rooting for you! Im sad….too much AIO5 Gevey was died…too much goes to the scrap. Why it is so weak???? Dear admin! I lost a lot of money! How can i make a life into these GVAIO5? The Reader cant see GVAIO 5, the settings is correct, no have driver or reader problem, these Geveys is weak and can die easily!!!! bro i totally i agree to u. plz admin look into this matter. Hello! I have Sprint 6.1 and AIO 5 with last FW. When i insert sim of carrier Beeline RU (Vympelkom) i see message “Simcard error”. Delay is 1, 6, 15, 20, 20. That can i will do more? Please use an older simcard model. Maybe this is the problem. Delay is not important so you don’t have to loose time with this. [11:13:35] [SERVER] To many updates for this GEVEY NO CUT. Please use a valid Update Key! is it AIO 5 or 4S ? Please post again your message ! Sorry, you answered me previous i send my second message.) Thks, now i try to change my sim and will try again. why i see “[17:56:19] Could not establish secure connection with update server.”? you are do some updates for AIO 5? or not? Hi I have just purchased iPhone 5 factory unlocked but they have sprint Sim card on it but i want to activate the phone with AT&t. I have also purchased x10 Latest AIO Unlock Sim Card iPhone 5 GSM CDMA Sprint but don’t know how to use them. Please HELP!! If your phone it’s factory unlocked why do you need a AIO-SIM ? Program AIO-SIM with iPhone 5 software V2 and find an old AT&T Simcard as will not work with new simcard models. [14:52:48] [SETTINGS] Unlock Delay is 25. [14:52:48] No GID1 will be used! [14:52:50] [SERVER] To many updates for this AIO5. Please use a valid Update Key! [00:07:03] [SETTINGS] Unlock Delay is 25. [00:07:03] No GID1 will be used! [00:07:04] [SERVER] To many updates for this AIO5. Please use a valid Update Key! Sorry, wrong card … check again ! I also tried to unlock UK Three with MTS RUS, but it don’t work. admin, please help us. Phone sees a network in settings, but falls out in activation. I have to change “delay”? I also can’t unlock verizon iPhone 4s 6.0.1 with MTS USIM v24. [18:52:07] Unlock Delay is 6 [SETTINGS]. Phone doesn’t react in any way. You can prompt parameters? I want to upgrade my iPhone to iOS6.1 and I want to use Philippine prepaid SIM card(Globe,Smart,TM,TalkNText,SUN). Can Gevey aio no cut v2 unlock it? Yes it can, use V24 and KDDI settings. this problem when install driver…. what to do??? HI, What is the solution for Fido on 6.1 4S. Hi. Sorry for my bad English, I making many iphone 5 with aio, but many times I have some problem, I have 2 phones one is Telenor Sweden, second UK 3. Ok Telenor SE working great with every SIM card , but UK 3 it’s only working with a one SIM card of 5. But when I put sims what is working on SE Telenor in UK3 it’s not working, where is the problem, on Telenor SE working all 5 SIM cards, but on. UK 3 only one of 5 what I tested on Telenor why? Now, the AIO SIM wont read at-all, and wont even be recognised, and its not even getting a signal on the iPhone anymore? Help? is the AIO-SIM dead?, can I get a replacement or repair this? Turn off the Pin1 sec. request. It makes the unlocking easily. If your AIO-SIM on V27, you need press the “Write settings”. If not on V27, press “Update”! I can’t try that, as when I press Connect, the AIO dongle no longer SEES the aio sim, even though it said it updated it, and wrote settings. It just stopped working.. Any way to revive or get it out of whatever mode it’s stuck in ?? It never failed updating or writing settings.. Sorry to hear this, in this case you need a replacement. You can try to check if it’s mechanically damaged and solder the legs of the IC back but if it’s something else you need to get it replaced. none of the legs of the black chip have come off the AIO SIM at all, it looks mechnically intact. How can I go about getting this replaced? – this was purchased via email from HAHNGROUP (yourselves I believe). I do not need a dongle or 10x AIO SIMs and a dongle, so just 1 (or 2 as a backup?) would be fine..
We can replace it on your next order (send you the replacement then) or if you pay the shipping immediately (please contact the ebay seller and tell him you’ve discussed this with us. (you can post a link here). The second one will not work to unlock my phone. I want to get it to T-Mobile. When I try to enter my settings into the website, the website says my AIO Sim Sn ( FA0139D9) is invalid!! I have wasted 3 updates already. I don’t know what to do! This is very confusing. Also- it appears that I am getting the t-mobile service, but I cannot activate the device at all. HELP, let me know what to do. Hi! Do you have a Gevey Dongle? I got it to work on 6.1 Now I am on 6.1.2 and lost everything. Any help here? can’t unlock iPhone 4s 6.1 Spaine Vodafone. I have problems with the software. in the section to configure. I get incomplete operator. are only the letter (A) through (D). [14:45:53] [SETTINGS] Unlock Delay is 25. [14:45:53] No GID1 will be used! [14:45:57] Timeout while waiting for card response! [14:45:57] [COMM]Communication Error while reading presets! Next Tether Activation Policy Description: US Verizon Multi-Mode commercial, UMTS VF NL Locked. 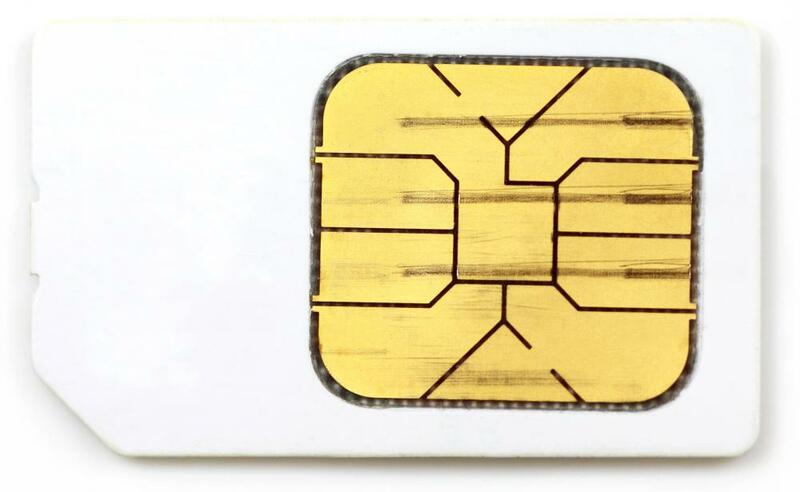 BTW I use sim card with 6 contacts (connections) and it is original micro sim card. Does it matter ? I think you can safely try with V23 too. Hi what about 6.1.2 update it’s working? PLEASE HELP, I have been trying to get this to work correctly for 2 months!!!!! It is not working for me, and keep deleting my comments. LV LMT , Iphone 4s 6.1.2 (3.4.02 BB) jb or not, doesn’t matter. Be so kind, stop deleting the comments and respond. I have a feeling that I threw away my money on some kind of scam. Hi, we do not delete any comments. It’s that sometimes it takes some time until we manually aprove them. This is necessary to fight spam. THEN HOW DO YOU USE 6.2.1!? 18:44:18] [SETTINGS] Unlock Delay is 20. [18:44:18] No GID1 will be used! [18:44:18] [OK] Settings applied successfully! Thanks,I will try tomorrow and give result. It did not work :-/ I had always activation screen. Done by other iPhone card. Hi! Ordered 20pcs. gevey for 4S and 5 at 09 january 2013 to Sweden and didn’t get it, check it please! Hi, sorry about this, we will contact you by email after we check what happened. Second day and still the server are not working !?!? But the counter is ! when will it be ready ? Hi, are you sure is a sever problem ? I just finished programming some AIO with no problem. Ok. Now i will give it a try without antivirus, but how come till now it was no problem ? And how come for iph4s i can program with no problem ? Does the AIO 5 support 6.1.2? server is down , please fix it !!!! [17:43:13] Could not send update request to server. V2 with Sprint 5 setting. Please use an older simcard model as new ones like micro and nano will not work. I have used a old T-mobile sim but I can NOT pass through the activation screen. I have tried an another Vodafone sim which is newer than my T-mobile and its worikng perfectly. I used V1 Sprint 5 setting! Why should I use V2 for cdma phone? Hi i have a big broblem. I cant unlock US Virgin Mobile locked 4S, always have activation screen. I;ve managed to program another one…Don’t know how, i just retried many times. Now i have 3 more to go….counter is 3 more updates for them :)).. Hope to manage until 0 . AIO5 is shittiy because i ordered 20pcs only 4 is working, before New Year everything was ok, but right now is totally bad, everytime gives me message sim failure, i lost lot of clients. Dan please make some fix, because you losing clients! What version of the AIO sim software do I use?! v24 won’t work anymore! GIVE ME A WAY TO UNLOCK MY PHONE, AS YOU STATED THAT 6.1.2 is supported for your company! Put out a guide, make it clear, and maybe more customers will come to you! As for me, If I can’t get some prompt service, I will return my AIO Sim and buy a gpp, I am tired of waiting! Same situation here. As far as I could understand the thing is that AIO on Iphone 4s 6.1.2 (3.4.02 Baseband) works only with old simcards. The new sims (already cut) will not work with AIO. -Download AIO FOR iph 5 and AIO FOR IPHONE 4s, chose v2 (not the activation one)copy the ICCID and IMSI settings for you carrier from there to AIO FOR iph 4s. -Disable Airplane Mode, wait for a bit ,if it prompts the SN and IMSI , just press “Cancel”. It might prompt SN before you Disable Airplane Mode. By the way, the SIM I’ve used is new. Was already cut out of the box. what If I’m on verizon and DO NOT have an original sim? any tips? perhaps clear the network settings, then put on airplane, install aio sim with your directions? Thank you for the answer by the way, I literally am without phone service until this is fixed, which is untenable. Try to activate with the same SIM (skip the activate with original SIM step). Or buy another/get another Verizon SIM. Also you could try specific settings for Verizon only, you have plenty of choices to test with. Also play with iph 5 AIO settings, it might help to activate. THoMZoNE! Te milyen beállításokat használtál iphone 5 sprint lockedhez? T-mobileos régi simmel (4 éves) akarom használni, de sehogy nem engedi, bezzeg a régi vodafonenal simán megy. ötlet? I have written so much e-mail about AIO 5. I didn’t get any replacement after 2 week. Now I want my money back so please answer me. I don’t want to open ticket on paypal…but I will if you can’t response me! I HAVE A PROBLEM “Preloaded SETTINGS” NO shows a country “U.S.” EXAMPLE “U.S. SPRINT” WHY? gevey aio is working on ios 6.1.2, tried yesterday and it worked great. Hi, what the difference of unlock delay using 6 and the unlock delay using 15..
i have 2 iphone of sprint and don’t work the aio sim. but i do the jailbreak and i install.. comcenter and clicker and i work….. what happent?? Unlock delay can be 25, it’s not important. AIO are working good, thank you, Admin. For the Glory of God, got my us 4s Verizon unlocked on 6.1.2! Use the v24 settings as prescribed in the 4s forums, with all settings listed there for 6.1. Now once you get the phone on, it will search an say no service. Go into cellular data and fidget with on /off , roaming on/ off, and 3G on/off. If you don’t have cellular option in settings, jailbreak with evaders, install tetherme and it should show up! Sadly i cant unlock 4S Canada FIDO! Sadly i cant unlock i5 with new type of sim cards! This is a very sad fact! Hi what about 6.1.3 it’s working? Hope this helps you and others 🙂 …. hey bro thx a ton…sorry for the late reply! hi admin, the new exe aio 4 and 5 cannot runt in windows xp¿???¿¿? gevey aio can unlock 4s 6.1.2 from virgin france???? Hi All! How can i unlock iPhone 4 iOS 4.3.3? With Furiousmod 888 i can get always No Sim or Invalid Sim message. What is the correct setting to work them? Where are the peoples? Where are the helping? Thanks, but how settings do i need updare the Gevey? [16:11:58] [SETTINGS] Unlock Delay is 25. [16:11:58] No GID1 will be used! [16:11:59] [SERVER] This AIO5 is not activated! Please contact your reseller! network name there incoming and outgoing calls there but no sms outgoing or cellular network…. help will be much appreciated.. Sorry 🙂 On V5 Need choose operator what locked the iPhone or choose operator what sim want use?? 😀 Sorry once again! bro first plz dont say sorry….u have been old frnd from gsmhosting. operator of the locked phone..
and bro i have found solution for sprint 6.1.3 and sms and 3g working wiht ipcc file of sprint. And have find solution for Verizon / Netherland Vodafone locked phone sms / mms sending problem? didnt test on those but if u have lower ipcc file of these..let me know …we can give it a try. should i mail u the deb file i have?? Bro please send the deb file to info@thomzone.net email address. Thank you! hi im trying to make iphone 5 6.1.2 vodafone spain too workbut its not working it tells me no sim card or activation error. Hello what about IOS 6.1.4 on iphone 5? it’s working? hi, i have the same question but for the 2 system, what about with the IOS 6.1.4 on iphone 5 ^ 4s and the aio sim? what config for iphone5 sprint ?? [14:44:59] [SETTINGS] Unlock Delay is 25. [14:44:59] No GID1 will be used! [14:45:05] Timeout while waiting for card response! [14:45:05] [COMM]Communication Error while reading presets! Hi, everyone. I have iPhone 4S Verizon 6.1.3 on hands and I am trying to unlock that with AIO-SIM. Could anyone help me what settings I should apply? any one succesfully unlock DE T-Mobile 6.1.3 ? i try all the setting it just keep searching or show carrier name without signal bar..
Im very sad / angry! More then 2 months ago i buyed 20pc of AIO5 we killed 4-5pc (wrong inserting), but but the others can not do anything because it does not work or not at all! Whatever option is tried, not at all does not work! Dan! You promised me a few improvements over a month ago, but they did not send it to us! Please support and your response as soon as possible, because you lose a lot of big purchaser! THoMZoNE.NeT, just check your sim trays. SIM FAILURE – the problem is with trays often. Hi! Not, i did spoke with Dan, he did make a promise they change my AIO5, because my chip is old type. But sadly cant buy an AIO yet with fast shipping, and i dont want waitink 15-25 working days with slow shipping. Sadly cant unlock iPhone 4, because always drop “sim failure” message. Every time i did set the Gevey software (V5 or V5.1), change the carrier options (to locked phone carrier) in Hungary use the 112 emergency call, but without FuriousMOD give “SIM FAILURE”, with it give many time later “SIM FAILURE” or “NO SIM” message….HELP!!!! What happened with Dan? I can not reach him by phone and by mail as well. So on the left side we can see the old type of AIO 5, on right side see the now type. The question is, what’s that on bottom of new AIO 5 sim? What can i do with that? Because if i want put this with sim card, it rather stuck. I did cut that “tail” on one piece, i tested it and it worked, like with “tail”. Why is it there and what can i do with it? I sad…very very sad…today i tried unlock iPhone 5 AT T-mobile locked phone, tried with all settings and all software, the endings always “Activation Required”. Why? AIO-4S is working with iOS 7 beta 1! work in in beta ios 7 beta 5? The question is, what’s that on bottom of new AIO 5 sim? What can i do with that? It must be under the tray. Who and how to solved the problem with trays? Many customers told us that problems with trays for iPhone 5 can be solved by bending the tray a little bit. Starting today we will ship extra trays for iPhone 5 with AIO 5 orders. The old trays can still be used if you try to bend them a little. In Russia 2 of 3 mobile networks are using USIM now! Have you any solution or not? I mean try to bend it using your hand just a little so it will be more fixed inside the phone. [15:18:04] [SETTINGS] Unlock Delay is 25. [15:18:04] No GID1 will be used! [15:18:06] Timeout while waiting for card response! [15:18:06] [COMM]Communication Error while reading presets! admin i have two cards with this same prob…please help! we also have some aio5 with the same problem. Hello. I Recently bought 10 aio sims for iphone 5. (on 14 of june). I tried all of aio sims , and the phone says “no sim card” or “sim card error”. How to solve this kind of a problem? Hi, most of this problems can be because of the AIO 5 sim tray. Please contact your seller to get tray replacements. When was new update for gevey i4s and i5, because in our country with new sim card’s not working(request activation)???? Hi, most of this SIM FAILURE problems can be because of the AIO 5 sim tray Did you received new AIO 5 trays with your order? You can just bend the trays that you have a little and they will work but in case they don’t please contact the seller. From the last order 5 aio for 4s had died in the first month of using! How can you comment the situation? Hi, this must be a coincidence. We did not change anything regarding AIO hardware. Maybe you can try to solder the IC better using hot air. Please inform us this when you make the next order. We did not change anything regarding AIO 4S so it’s strange. But a few day ago, gevey from the last order in my iphone 4s has died. I put it in dongle, and it wrote me,that gevey not found. Yes i believe you, sometimes it is happening that the IC ‘dies’ because of electrostatic discharge. Normally electronics are not meant to be touched in the way gevey is. No its, not problem with sim card tray, aio sim can’t unlock iphone with carier new sim card, Iphone show activation screen.I tested with iphone 5 locked to Uk three carier, and iphone 4s locked to verizon, with old card of carier it’s work fine, with new sim card’s iphone 5 and 4s request activation, with same setting of aio sim. Hi, don’t worry. We have seen your emails and we will send it to the address that you have instructed us. Best regards! Select “4S patch for Sprint/Verizon” in the list and let us know if it’s working. Try to patch it first using the new software we just released. [23:08:54] AIO SIM not detected at existent ports! [23:08:54] Please reinsert AIO SIM DONGLE test connections or reinstall drivers! What can I do to update my AIO Cut version? V4 does not pass antivirus software..
Is gevey AIO CUT version supported? Gevey AIO CUT is not a product of this web site. I did sent a mail from my mail address: sales@thomzone.net, but not get answer. The shipping address is valid, but you must add the mobile phone number to shipping details!. PLEASE ANSWER TO MY MAIL! Thank you! Hungary news: The Gevey AIO 4S is working with iOS 7! Yes. That is the question 🙂 And what about SIM-trays? Yes. These sim trays is very poor and weak. But sometimes is good. Hurray! I did it! I did unlock iPhone 4 again with AIO-SIM V5.1. Why r-sim is working with T-mobile and Vodafone in iPhone 5 in Hungary and why didn’t working our AIO 5 Gevey? Please try the new V4 and post here the results. In order to use the NANO simcards please install iRose on your mobile phone. If you use irose for r-sim, you have to use it for aio5 too. In spain not work with Digi, 50%Yoigo, 50%movistar, Ono, .. I installed yours patch i restarted but notfing searching – no service then searching again no service…..
did you tried to install iRose ? yes i installed iRose, i select first and first option and i restarted the phone, alway i recived searching for ~~30-50 second and the No service ~~30-50 seconds, without iRose i not have No service only Searching. Another question, v4 from AIO5v6S1 no work with some sim cards, BUT WITH V4 FROM AIO5N5S1 work perfect, I need solution for spain = Digi, Gt mobile, Ono, Lyca, Some Yoigo, Some Movistar and i thik for more sim cards. V4 here in spain work with almost 30% of the sim cards! Same question with r-sim8, not work with mentioned sim cards. 4s work perfectly with any sim card. It’s interesting what you are saying here that with the latest software V4 will not work with all simcards. I will check on this first. i tried without Aio and i have same problems, ussd error or notfing, etc etc, i think is not Aio problem. but 3G is not working (NOT CDMA PHONE). Use irose in case of Usim only. And if Usim – EDGE is available only. CDMA or GSM – not important. There is only one way to use Usim for the moment – disabling 3G. I had an iPhone 5 lock on UK Vodafone,when I try to update with v2 6.x.x improved I got an error,reconnect failed and the program closed. Good day, everyone. I have iPhone 4S Verizon on hands 7.0 (11a465) imei: 990001843535824 and I am trying to unlock that with AIO-SIM. Could anyone help me what settings I should apply? Remember your SIM must be without PIN lock. Delay ? Fast? imsi ? who resolved problems with unlocking Crickets iphone 4s\5??? Hello, does anyone find any solution for USIM from Vodafone RO? I have an 4S IOS 7.0.3 is working ok with old sims but is asking for activation with new USIM. What can I do? I tried IR0SE, but not working for 4s. Any other idea? Any imsi for us sprint iphone 5c or 5s?? i try with 3101200, 3101201, 3112300 and nothing work. This is a different problem not a IMSI one. We will announce here once is solved. Plz help ! I have iphone 5s locked on AT&T, with aio sim works every thing except 3G (data roaming is enabled). How can i enable 3G ? Hello please i need help i cannot unlock finland DNA, NONE of your settngs are working phone stays at activation screen, i searched in google but still no luck please respond ..
anyone with uk o2 ios 7 correct settings?? I receive many people with icloud locked (find my iphone) and I can’t activate it,can be done something to use it? Nothing can use yet. Or have one website, where they can open 5, 5C, 5S for 99$. Good day, everyone. I have iPhone 4S t-mobile DE on hands 7.0 and I am trying to unlock that with AIO-SIM. Mts Russia old sim 2 minute working, and then issues an error. Could anyone help me what settings I should apply? Hi! Use Aio4V3 and use the default DE T-mobile settings, but delete the GID. And play with Delay: 8, 18, 20, 25 sec. But firstly start the default DELAY. does it work with 5S Sprint 15.5 ? Does jailbreak helps you to continue this unlock? because i buy iphone and it’s ipod right now for me…. Where you can Find a very good Deals on t mobile uk unlock iphone 4s. C output is possible jailbreak, unlock iphone 5s sprint without problems with activation? I have a question,aio sim supported iphone 4 ios 5 – 7 04.12.01 ? I have the Iphone 5. JP KDDI.What data for KDDI insert in your program to update AIO5 ? I have the Iphone 5. JP KDDI.What data for KDDI insert in your program to update AIO5 ? IMSI: 44078 ? I have the Iphone 5. JP KDDI.IMEI 990002309309688.Serial No:F17JNW1NF8H4.ICCID 89701991800214034504.What data for KDDI insert in your program to update AIO5 ? What IMSI put to update ? I have recently bought 10 x AIO 5 sims. I cannot connect to them. I followed all the recommendation and read a lot of information. The switch on the dongle is in the right position. The COM4 is less then 10. The driver is installed correctly. I tried at my computer (windows 8 x64), my friend’s laptop (windows 8.1 x64) and Virtual machines (Windows 7 x64). I tried several AIO sim cards with hundreds of possible position. i think its high time we really need to work on sprint 5s???? Admin I would also like to mention about the quality of the aio sims, it gets damaged so easily, it gets stuck while inserting….plz have a look into this.. I by AIO 4 FOR 4S 10X PACK INCLUDING DONGLE. When you send an order? Thank you. is aio working well with ios 7.1 ? I have posted on the main page a new post. We will keep you informed of the developments. We are now making tests to see what is working and what is not working. Sorry guys , but what happen with new AIO 5 server ? I have more then 10 iphone 5 geveys bought from you and no one can be detected by sw .. But before all was working fine , and i still can program 4s geveys . So pb is not in drivers or adapter. I still have pb with aio for iphone 5 detection by sw. but in same time sw can detect aio for 4s. and it saw aio 5 befoe. could be the problem in dongle ? should i buy new one dongle adaptor or send cards for replace ? is possible to have this patch too ? What is that? 4S / 5 / 5S / 5C? What procedures should i make ? Please press SHIFT KEY when software is loading so you can refresh the updates list. Then select the V27 Sasha+ update or V27 Sasha- update in the list. This updates are different than the V27 Sasha already there. So first refresh the list then update again your AIO. We are working not to solve the SMS issue on some simcards. An update will be available in 1 day or so. We have emailed you regarding the SMS issue. You can test the new Sasha+ update using out test software. Hi, please Test V27 Sasha+ and Sasha- and post results with this. Thank you ! MMS is a different problem than SMS, once SMS is ok i will try to make update for MMS. ATT 7.1.1 5s works with IMSI 310410. [17:49:54] AIO SIM IS IN NORMAL MODE and i want to set it up for one iPhone 4s ios 7.1.1 locked on Softbank Japan i need it to work with the newest USIM from a network Digi.Mobil Romania and to make the activation for the phone. what version of update shall i use? v.30+test? what IMSI and right ICCID shall i use? I THANK YOU ANTICIPATED FOR YOUR HELP!!! [19:46:18] AIO SIM IS IN NORMAL MODE and i want to unlock/activate one iphone 4s blocked on Softbank JP the ios is 7.1.1 what update should i use? v.30+test? or what? and what IMSI, ICCID and DELAY shall i write to can also activate??? thanks!!! [19:46:18] AIO SIM IS IN NORMAL MODE and i want to unlock/activate one iphone 4s blocked on Softbank JP the ios is 7.1.1 what update should i use? v.30+test? or what? i want to use it with a new usim card from a carrier named Digi.Mobil Romania! and what IMSI, ICCID and DELAY shall i write to can also activate??? thanks!!! do you have soulotion to solve smsm problem iphone 5s,5c on ios 7.1,7.1.1? in mexico, 5s iphone with ios 7.1.1 can not be unlocked, they recognize the sim, and out of the window of activation, but the signal is not activated, the signal search, then find the operator telcel, movistar or iusacell and then go back to look, but I have a telcel sim and it works fine, but with other SIM no work..
is the sim? foun with 64, 128 or 256 bit? When I switch OFF 4G then it is ok – stable coverage. How to get internet at least Edge ? Hi anyone with Cricket 4s 7.1.2 correct imsi???? are you guys even interested in selling them or not….very annoyed with sales staff……..have been droping mails regularly…..but no reply…..
need help ..iphone 5c bell canada. but no 3G or E so can not internet, try v24 ,27,27+. with v7 or older version goes to activation required..
Any one on cricket 4s??? Can’t get activation key for patch. Не получается получить ключ активации для патча. Ввожу SN и IMEI. aio 6 dont work today, any solution? No solution for the moment. You can still use normal updates depending on country. how i can use normal update, i have imsi list, can you help me? Greetings what is the new update? As you may know, iccid that’s currently used for firmware v41 and v42 was blocked on 01.01.2018. A bit strange that there is still no information about this on your site. Also – is there any ETA for the new iccid ?